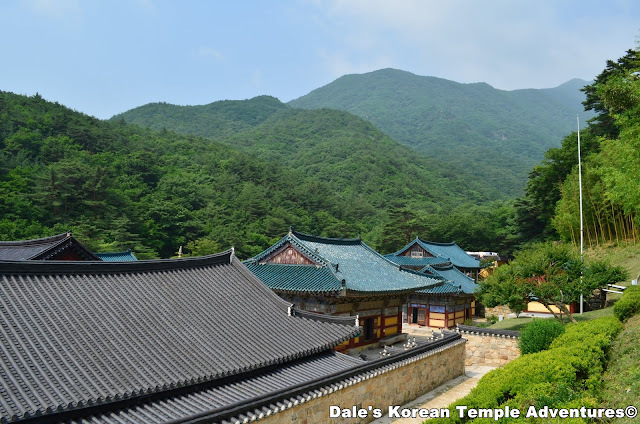 Seoknamsa Temple (pronounced Seongnamsa) means “Southern Rock Temple” because of its southern location on the Gaji mountain range. 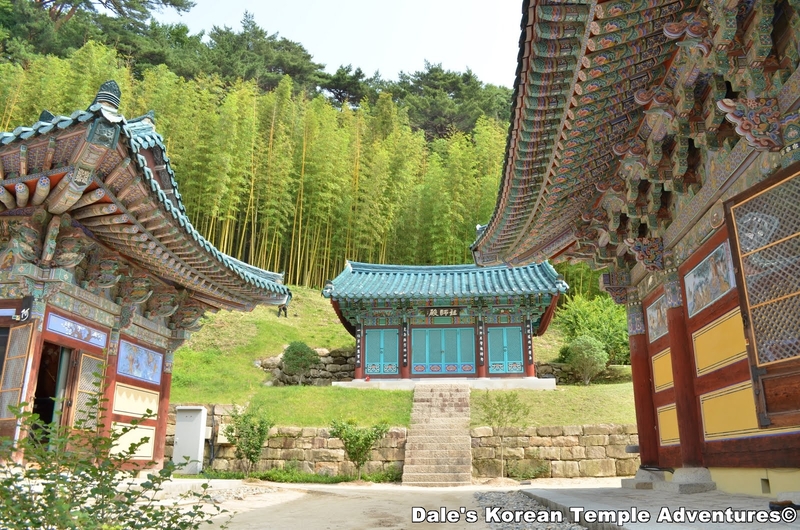 Seoknamsa Temple was first built in 824 by monk Master Doui. 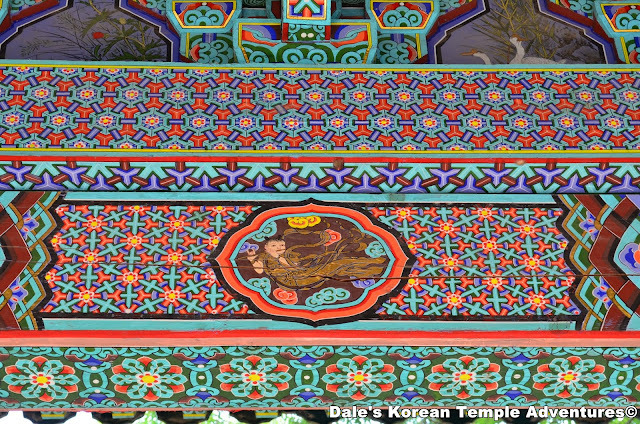 The temple was continuously enlarged until the Japanese Invasion of 1592, when the temple was completely destroyed. However, in 1674, under the watchful and loving eye of Zen Masters Takyoung and Sunchol, it was rebuilt. And through the years it was enlarged both in 1803 and 1912. 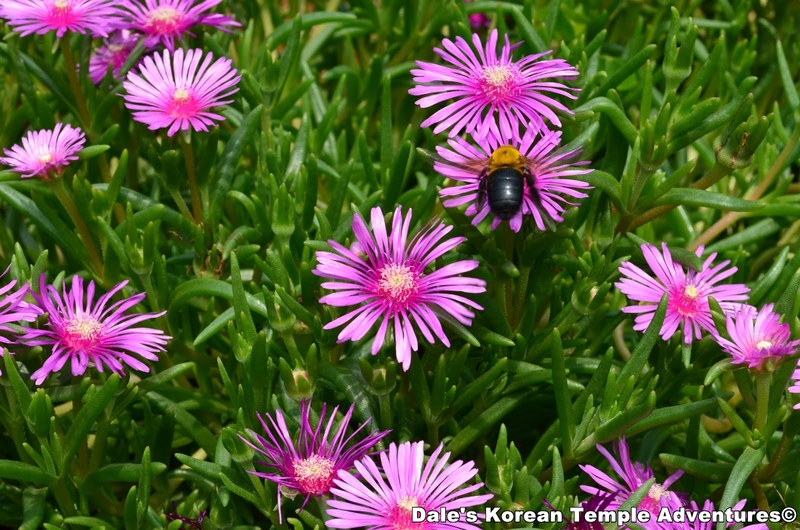 More recently, and after the Korean War, nuns (bhikkuni) have been residing at the temple. 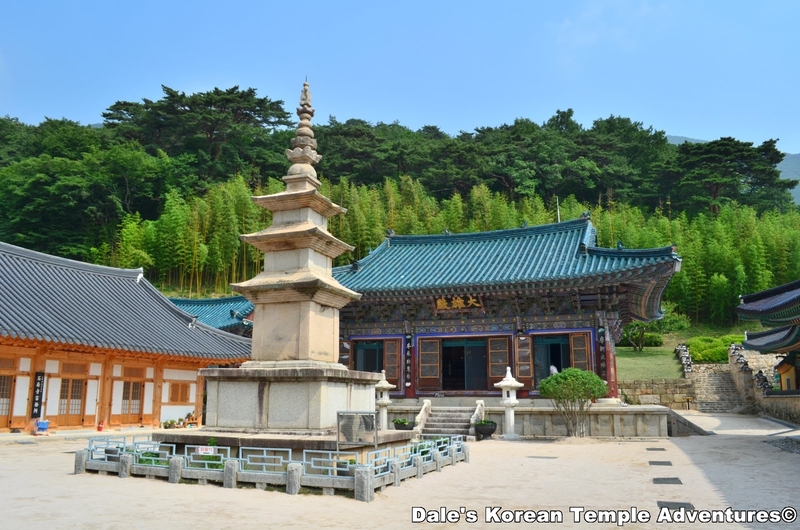 Presently, the temple is under the supervision of Abbot Monk Inhong who has remodeled and rebuilt many buildings including the Daeungjeon (The Main Hall) and Gukrakjeon (Paradise Hall). 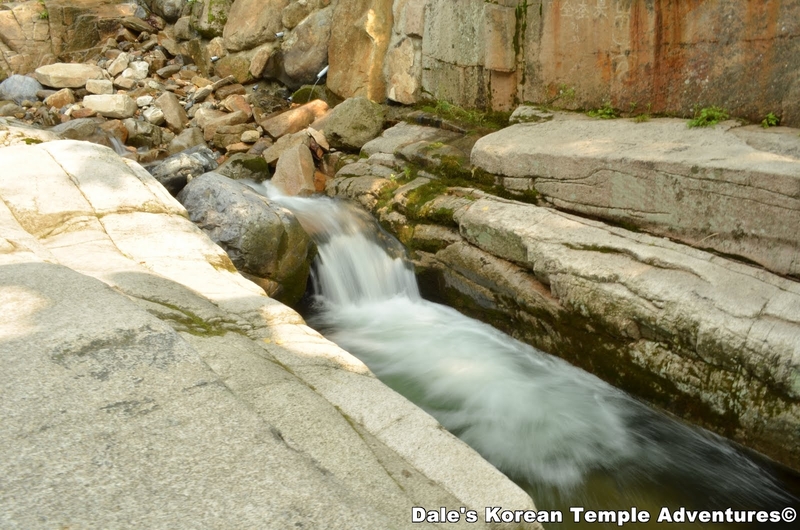 Situated under the towering Mount Gaji, and alongside a cascading river valley, is Seoknamsa Temple. 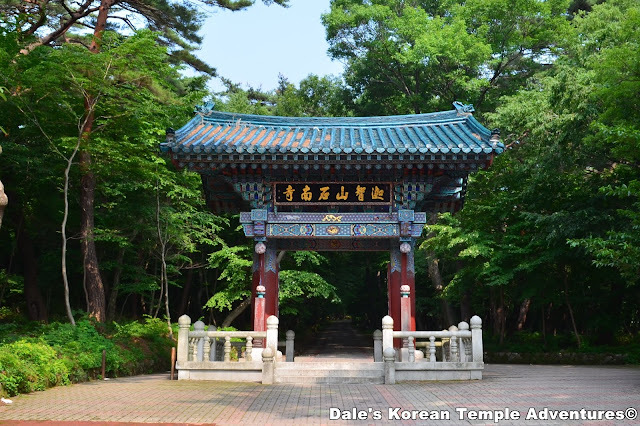 After passing through the colourful Iljumun gate, you’ll make one of the most beautiful one kilometre walks up to a temple in all of Korea. 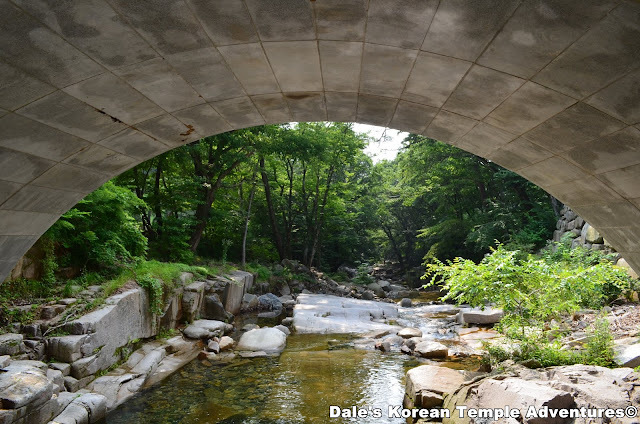 After the beautiful walk, you’ll come to an opening where there’s a new bridge. Underneath the bridge are cascades of water that pool crystal clear. There are rocks that act as steps that lead the way down to the base of these cascades. The potential pictures you can take here are endless, so take your time and enjoy the view. After getting your fill make your way across the bridge and up a twisting road. Again, cross over another newer looking bridge and head left around the elevated outskirts of the courtyard. 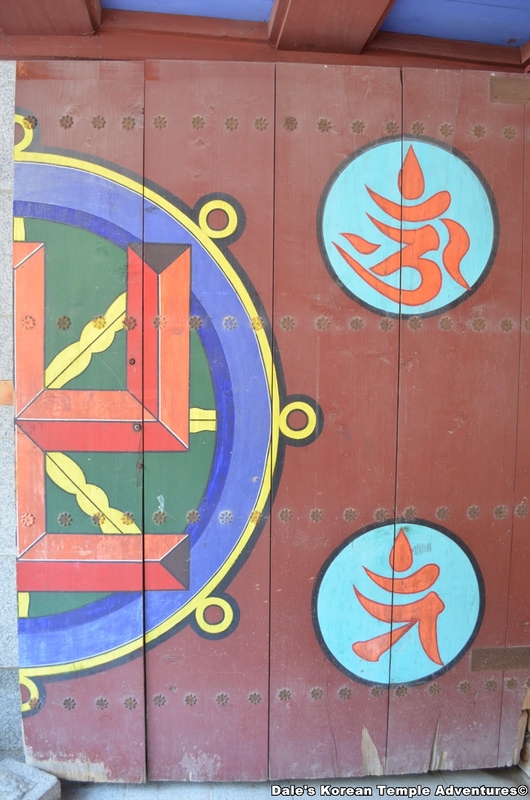 Passing under a meditation centre, you’ll pass through uniquely painted entrance doors. Instead of having the customary guardian paintings, there are four Sanskrit circles. Each aids in ridding yourself of bad karma. And at the centre of the entrance doors is the Buddhist sign for enlightenment, as well as the Buddhist Wheel of Life. 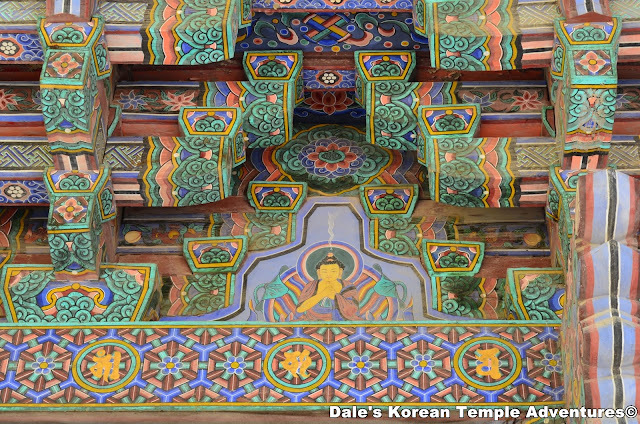 Up the staircase, you’ll first be greeted by the ancient Silla pagoda that stands in the temple courtyard. The three-tiered Seokgomoni Pagoda was built by the founding monk, Doui, in 824 in hopes of protecting the country from foreign invasion. 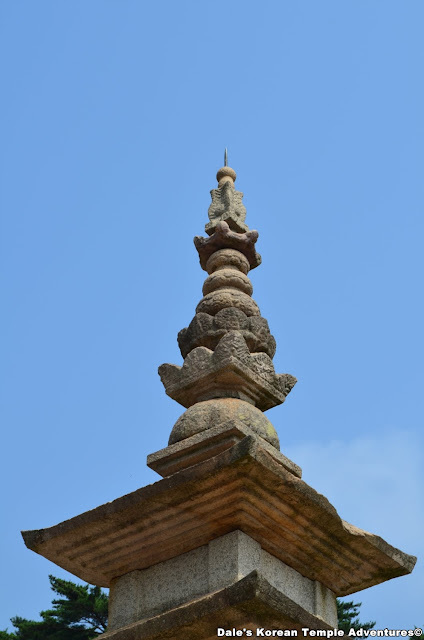 Unfortunately, this intention didn’t come to fruition, because the pagoda was destroyed in 1592 by the Japanese invasion. In 1973 the pagoda was restored by monk Inhong. 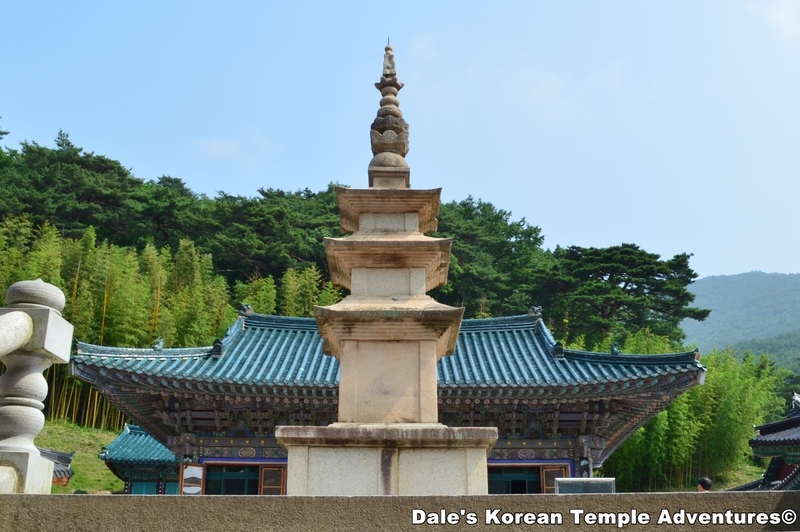 Behind this pagoda is the main hall, Daeungjeon (“Great Hero Hall”). 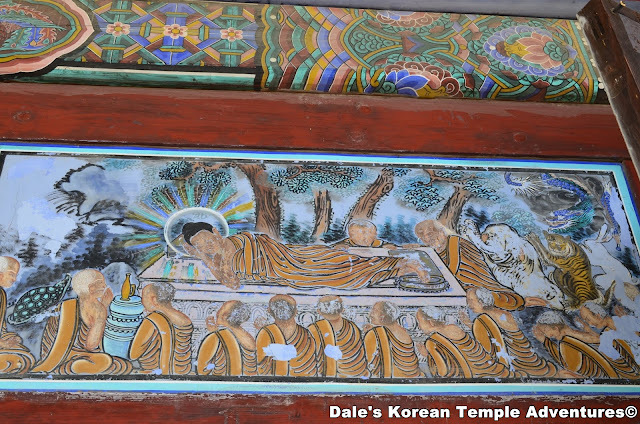 The main hall is externally painted with beautiful paintings of Palsang-do (The Eight Scenes of the Historical Buddha’s Life). These paintings are peeling but unbelievably realistic. Also, throughout the eaves Buddhas are painted with smoke uniquely rising from their heads. 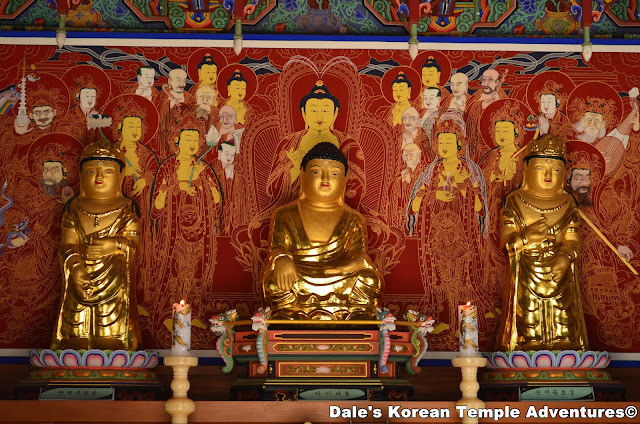 Inside the main hall, and sitting at the main altar, is a statue of Seokgamoni Bul (The Historical Buddha) with two accompanying Buddhas: Mireuk Bul (The Buddha of Future Salvation) and Dipamkara Bul (The Buddha of the Past). 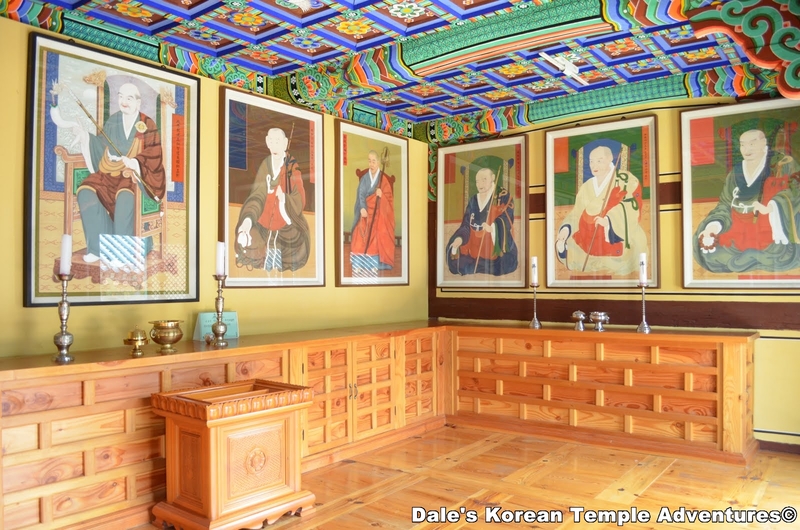 To the right of the main hall is an area that is off-limits to the general public as it’s a living quarters and meditation area for the nuns. 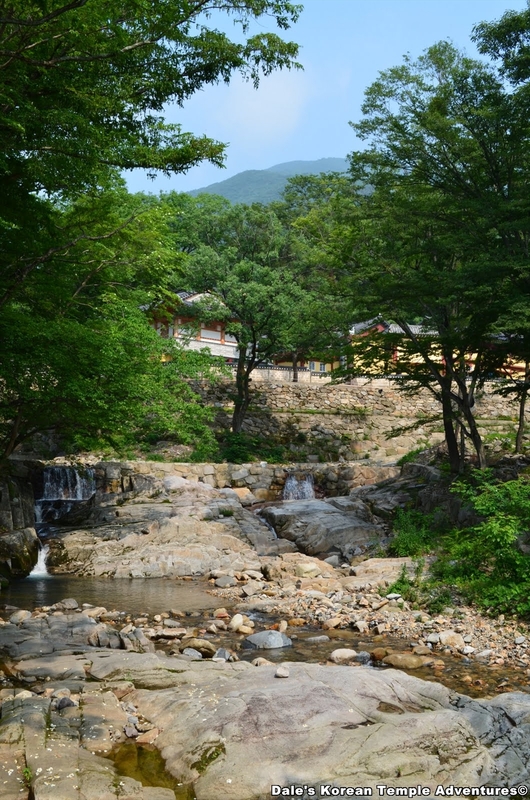 To the left of the main hall, on the other hand, is Gugrakjeon (Paradise Hall). 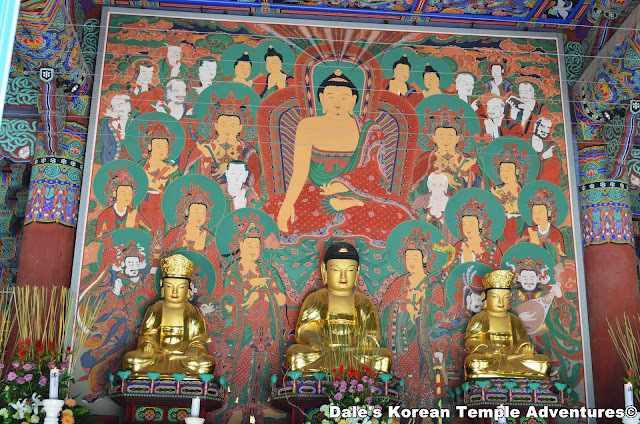 Inside the main hall, and on the main altar, is Amita Bul (The Buddha of the Western Paradise) in the centre. 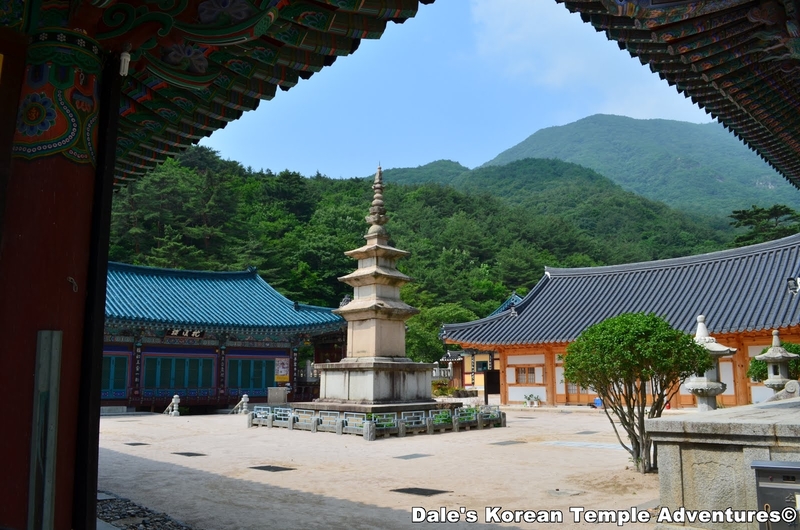 To his left is Gwanseum Bosal (The Bodhisattva of Compassion) and Daesaeji Bosal (The Bodhisattva of Great Power). The exterior of this buidling contains numerous unique paintings to this temple like monkeys playing. 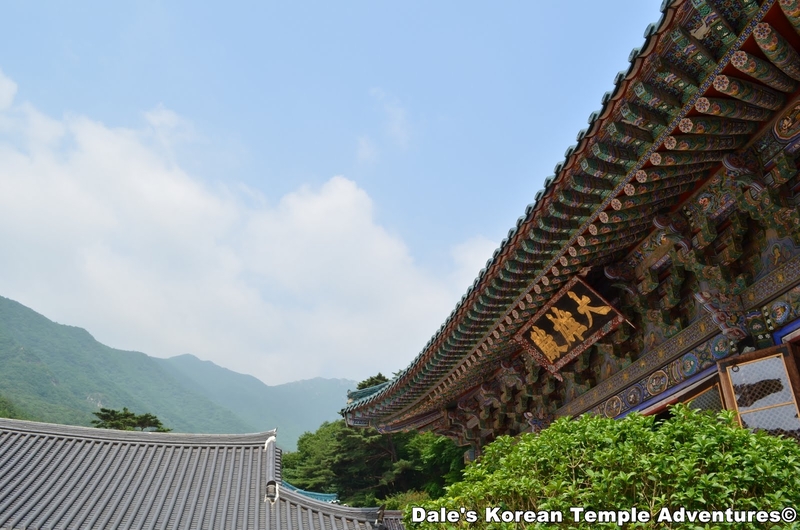 Even further left is the more compact three-tiered pagoda that dates back to the late Silla Dynasty. Behind the Gugrakjeon Hall is Josajeon, which is a hall for placing the portraits of historic priests that resided at the temple. At the centre of these paintings is a painting of the founding monk, Doui. 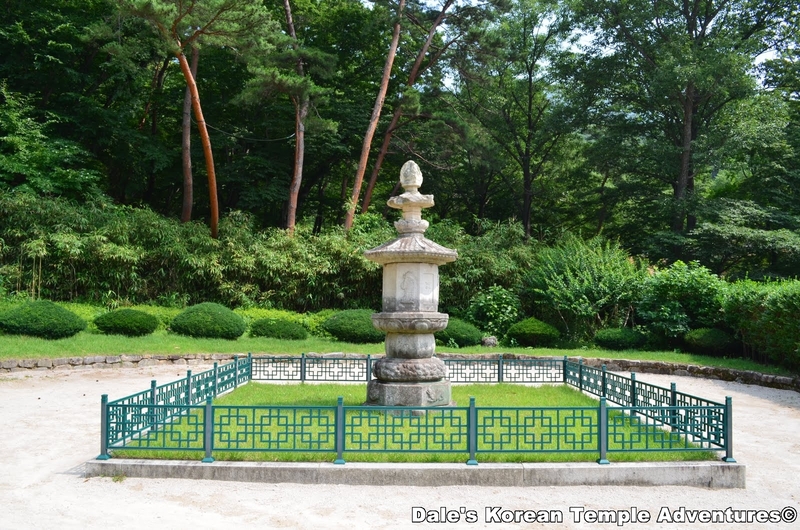 To the right, and behind the main hall up a couple flights of stairs and well-manicured grounds, is a stupa that contains the earthly remains of the founding monk, Doui. From this stupa, you can see the entire temple compound. There are some beautiful views of the valley, the temple, and the mountains above from here. 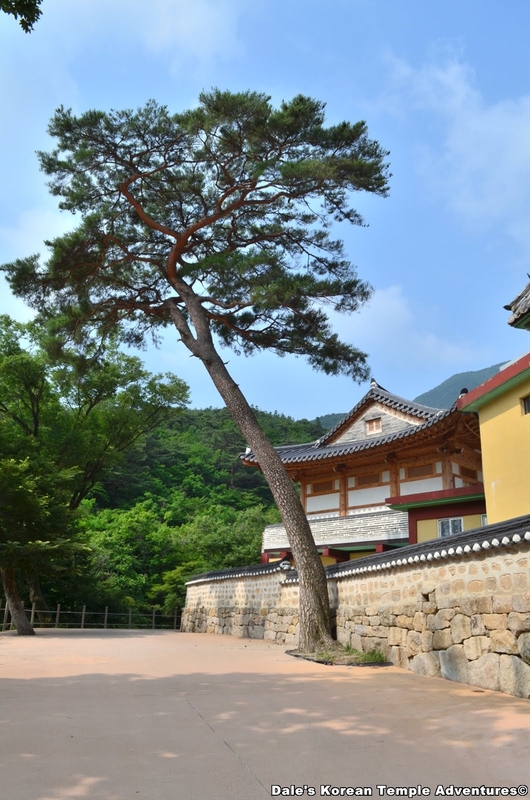 HOW TO GET THERE: First, you’ll either have to get to Miryang, Ulsan or Eonyang to get a connecting bus to the Seoknamsa Temple. From Miryang, you can take one of the numerous buses that travels throughout the day from the Miryang Bus Terminal. 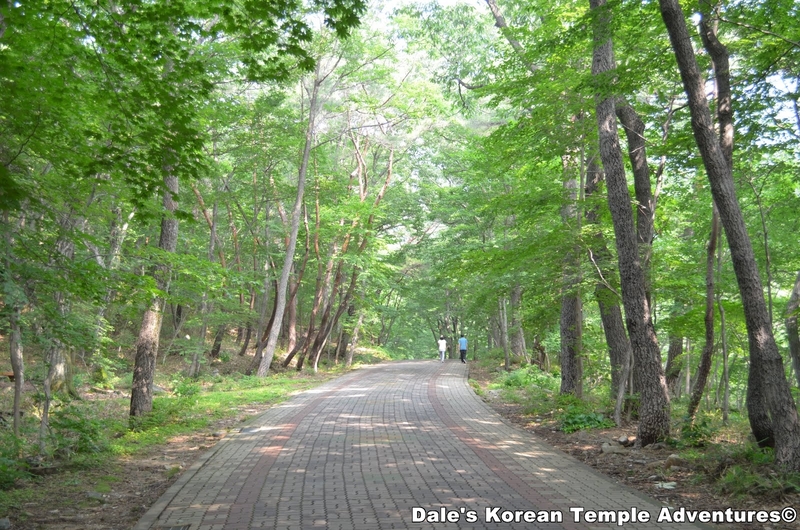 The cost of the bus ride costs about 5,000 Won. You can take bus number 807 or 1713 from near the Ulsan intercity bus terminal. 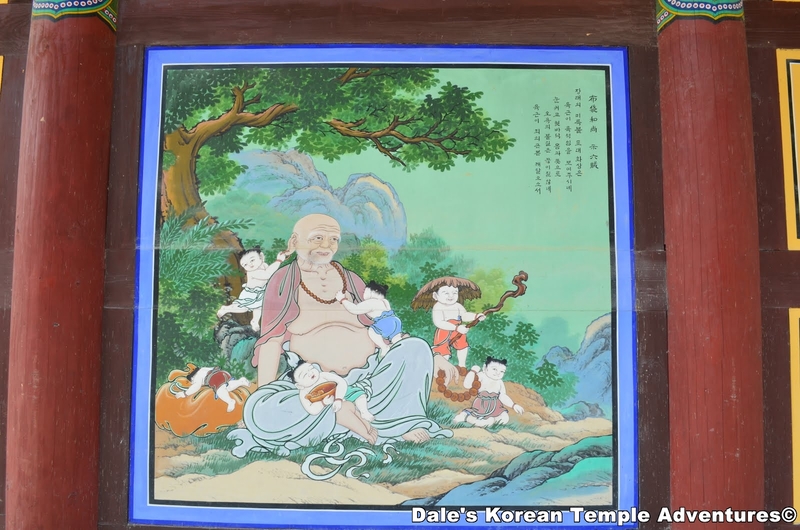 Also, you can take the Eonyang city bus that travels out to the temple eleven times during the day. The altar pieces inside the main hall: Seokgomoni Bul (The Historical Buddha) with Mireuk Bul (The Buddha of Future Salvation) and Dipamkara Bul (The Buddha of the Past). The peeling, yet realistic, painting of the Buddha's earthly death. 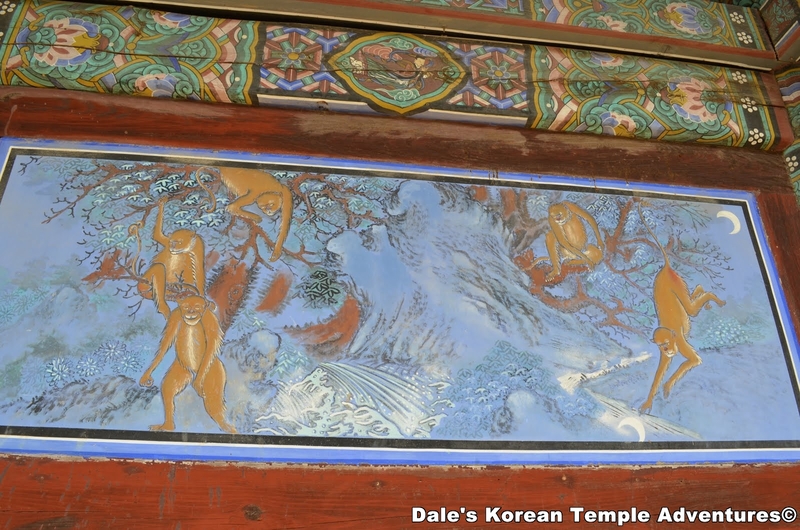 Uniquely, there is a dragon, a tiger, and a white elephant in attendance to the right, as well as a turtle to the left. 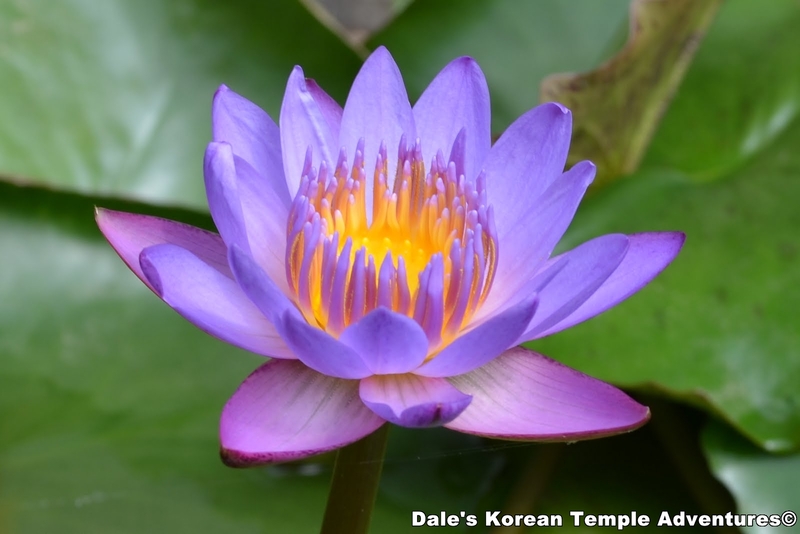 All are highly symbolic in Buddhist artwork. 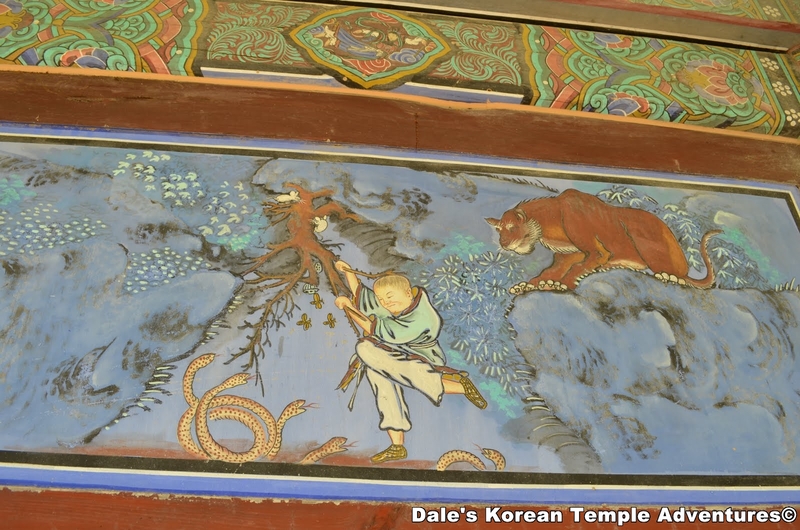 Just one of the many beautiful paintings at the temple. This one illustrates the Dharma. A view of Daeungjeon (The Main Hall) to the right, Gugrakjeon (Paradise Hall) to the left, and Josajeon (A Monk Portrait Hall) in the centre. The altar inside Gukrakjeon (Paradise Hall) with Amita Bul (The Buddha of the Western Paradise) in the centre and to his left is Gwanseum Bosal (The Bodhisattva of Compassion) and Daesaeji Bosal (The Bodhisattva of Great Power) to the right. An extremely unique painting that depicts monkeys playing. 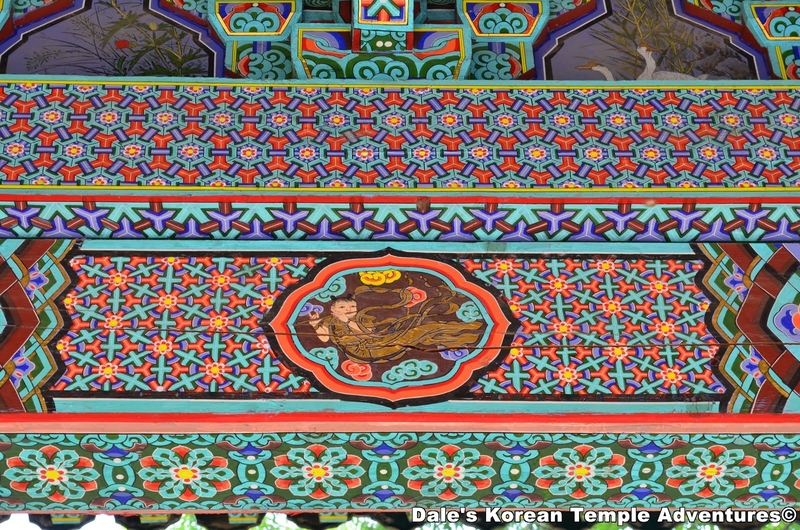 I've never seen this at any other temple in all of Korea. I've seen this painting at several other temples; however, what makes this one different is the lion looking down at the man. Usually, it's a white elephant that looks down at the struggling man. And a look at the physical, and symbolic, crown of the temple: founding monk Master Doui's Budo, which contain his earthly remains.